Season two got off to a great start, digging deeper into the conspiracy and driving the characters forward in the two hour premiere event. 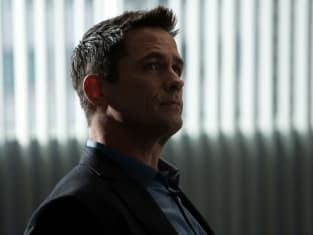 Yet as the season has progressed, the momentum has seemed to be slowing down and while the episodes were certainly decent, a lot of it felt like more of the same. Rain, sadness, grief, more rain. Which, as much as I or anyone jokes about the weather of Seattle, provides the perfect additive for the dark and continuously dreary tone of the show. Except even with all of the questions surrounding characters' haunted pasts and struggles in the present, there was a lack of something at stake. Tension felt absent and the case seemed to be hitting a brick wall, even if more clues were popping up. "Keylela" struck with such a dramatic force that it reinvigorated what made the series compelling in the first place. Suspense soaked the hour and believable emotions rang high. This was an episode that made me care and pushed along fantastic scenes where I wanted to see what would happen next. It was truly a pleasure watching both Linden and Holder work as detectives, trying to solve their way through the mystery, and not just having a new potential perp appear for them to interrogate. While Linden's hunch lead her to the Indian burial ground and the ominous warning from Nicole, the head of the casino, it was Holder's tricks and maneuvering that proved both entertaining and useful to the investigation. He not only got a lead on where Rosie's backpack came from, but learned of a mysterious in the process of being renovated tenth floor of the casino. Honestly, though, Joel Kinnaman cracks me up with all of his The Killing quotes and sharp remarks. He's definitely a conflicted individual, but his personality shines through so you want to watch him on screen. He's a character worth following. Mireille Enos brought Linden to another level, too, trying to desperately to hold onto solving the case and take care of her son. I truly felt for her as she sat powerless with the police officers questing her parenting. Even trying to comfort Jack in the car was a tough scene to watch as she tried to wrestle with running from the police and feeling the emotional strain of the pain she's causing. Life is not working out well for her. And while I enjoyed watching the detectives take up a good portion of the screen time, it was nice knowing they are on to something. I really don't know what it is. They don't know what it is. But it was the mere fact that they were crossing into a territory that threatened both their careers and their lives that raised the stakes. Having Holder suffer the beat down consequences while Linden listened on the phone? He's a cop! You can't just do that. The ominous dark setting mixed with his desire to crack jokes while getting pounded was the perfect way to end the episode. It wasn't a cliffhanger, really, but it established a real danger in digging into the case. It had me gripped. Sure, the pacing was great and the focus riveting, but the actors were really on their game. To be honest, I usually find the scenes with Stan Larsen and even the campaign more hit or miss. Not the case this go around. Richmond and Stan speaking together struck a great emotional chord and I felt for both sides. 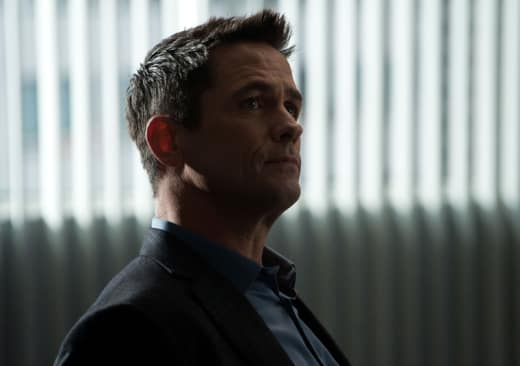 Billy Campbell has managed to take the consistently smiling and driven Richmond to a more broken level that is filled with a quietness. Richmond may be returning to the campaign, but his accident has left him a changed man. Campbell's brought a deeper vulnerability and the line "Make them care" was spoken with such sincerity and conviction that he certainly made me care. Brent Sexton who plays Stan, turned around my thoughts on the grieving father. Not only was I pleased he didn't fall for the campaign ploy without a signed document, but I forgot that he was playing a character. From his quiet moments, his outburst on Terry, and his heartfelt speech on TV, Stan captured the effects of losing a child. He was willing to give everything he had, his mere $12,000, for simple help. This is the type of episode I want to watch. I was gripped with both the case and the outside characters in a way that I haven't normally. Drama, stakes, tension, and character encompassed the whole chilling hour giving me something to care about and something worth watching. Grab your umbrellas. It's time you head back out into The Killing.